People and pets routinely died from infections before penicillin, the first antibiotic, was introduced in the first half of the 20th century. Today, veterinarians use antibiotics to treat many types of bacterial infections, including skin, respiratory and gastrointestinal infections. Although antibiotics can help your pet avoid serious illness or even death, they can lead to other problems if they're not used correctly. Understanding how and when the drugs should be used will help you ensure that your furry friend truly benefits from these life-saving medications. Antibiotics have a very specific purpose: killing bacteria. If your pet has a viral or fungal infection, an antibiotic will be ineffective. Antibiotics, like all medications, have side effects. Taking a course of antibiotics can upset your pet's stomach and cause vomiting or diarrhea, in some cases. Antibiotic use may also increase the risk of a yeast infection. The benefits of antibiotics outweigh the risk of side effects or secondary infections when your pet actually has a bacterial infection. If your cat, dog, guinea pig or other pet doesn't have a bacterial infection, you'll needlessly subject them to these uncomfortable health issues if you give them antibiotics. Veterinarians calculate antibiotics dosages based on the type of pet, weight and the particular infection. Some pet owners try to save a little money by using their prescriptions for their pets. Although amoxicillin, penicillin and tetracycline are often used for both pets and people, the dosage you take is probably too strong for your pet. Even if you cut the pill in half, the dosage may still be too high. 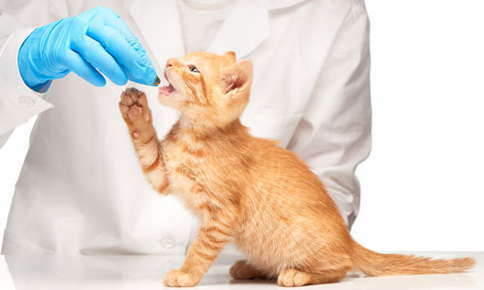 Sharing antibiotics between animals isn't a good idea either, as the dosage each pet needs may vary. If you've had an ear or sinus infection lately, you probably know that doctors now take a "wait and see" approach to prescribing antibiotics for the infections. Because these illnesses are often caused by viruses, antibiotics may do no good and might increase your resistance to the antibiotic. If you become resistant to an antibiotic, it will no longer be effective in treating bacterial infections. The same problem also happens in pets. Using antibiotics too often, particularly when they're not really needed, can increase the chances that your furry or feathered friend will become resistant. If your pet has frequent infections, blood and other tests may be recommended to determine the source of the problem. For example, allergies may be the reason that your pet develops so many skin infections. Treating the allergies will stop the infections and reduce your furry friend's reliance on antibiotics. When giving your pet a pill seems a lot like wrestling an alligator, it may be tempting to stop providing the medication once your pet seems better. Unfortunately, if you don't give your pet the entire course of antibiotics, the symptoms can come back. Failing to finish antibiotics can also increase antibiotic resistance. If your pet misses a dose, it's fine to give him or her the medication as soon as you realize it's needed, as long as it's only been a few hours since the antibiotic should have been taken. If it's almost time for the next pill, don't give your pet the missed dose. Instead, provide the next dose at the scheduled time. There's no point in continuing to give your pet an antibiotic that doesn't work or causes severe side effects. Call the veterinarian if your pet's condition doesn't improve or worsens after taking antibiotics for two or three days. If your pet experiences difficulty breathing, hives, seizures or severe weakness, seek immediate emergency care. These potentially life-threatening symptoms can occur if your pet develops an allergic reaction to the medication. It's important to mention other medications, both prescription, over-the-counter and herbal, at the time your pet is prescribed an antibiotic. In some cases, other medications can interact with antibiotics, and either cause unpleasant side effects or decrease the effectiveness of the antibiotic. Proper use of antibiotics can keep your pet healthy. If you have a question about your pet's antibiotics or are concerned about a health issue, call us to schedule an appointment.